Two weeks ago, I had the privilege of listening to my friend Richard sing and play guitar to songs from U2’s Joshua Tree album. I had not heard much of Joshua Tree in the years since I wore my cassette tape of it out back when I was in Bible college. Throughout the evening, Richard had me awash in college memories. I was struck by how many of my memories included going long distances on open roads, whether it was for weekend choir or preaching trips or visits home to see my parents or adventures in the hometowns of my college friends. And Joshua Tree was one of a handful of albums/cassettes that provided a soundtrack for much of those years. So, if you are reading this, Richard, thanks for taking me a sentimental journey that night. Ha la la de day. It’s a sad song, a song about love not quite going right, maybe even about life not quite going right. It’s a dirge, a lament. Even before Tuesday, it had once again become a soundtrack, a part of me. Obviously, much has been written about Tuesday, all of it on Facebook. Well, most of it on Facebook. We’ve certainly had the opportunity to air all of our opinions about this election and the aftermath. If we thought it was divisive before and we thought it would go away after the election, we misjudged that as grandly as many misjudged the outcome of the election itself. I voted for Hillary Clinton. I can’t imagine anyone being shocked by that admission. I don’t love her in the way some of my friends do, but I did feel that with the options presented, she was my, our, best hope. I will also admit to being a big Obama fan, too. I would happily sign up for four more year of him and Michelle. Yes, I know that not everyone feels the same way. Also, for the last week, I was working on a written piece that I hoped would be a part of a storytelling show. I recounted one of the worst things that ever happened to me, maybe the very worst, and the show’s director asked for rewrites that took me further and further from a workable piece. Have you ever written paragraph after paragraph and with each sentence found yourself drifting completely away from whatever it is you wanted to say when you started writing? When this person told me that I would not be asked to participate, it was a crushing blow. Are you ok, they asked. No, not right now, but I will be. Yesterday, after not speaking to each other since pre-results Tuesday, I called my parents. We do not talk politics much, we are not on the same page. But I was shocked to find out just how truly gleeful my Dad was about Trump’s victory. I tried to explain that I was worried about my safety and my civil rights, but he was more interested in telling me the ways Obama failed these last eight years and that Hillary should be in jail. It got heated and then it cooled. My Dad said that with Tump being president, I have probably never been safer. They told me that they loved me, I told them, I know, I love you too. I did not post much to my FB wall this week. I made a joke about moving to Canada (how original) early on Tuesday when I still had some hope that the direction the night felt like it was headed was not going to careen in the way that it did. The next day, I posted a picture of my dog Ricky looking super adorable at the Blessing of the Animals at my church last Sunday. Also, on Wednesday, I posted a picture of Khizr and Ghazala Khan, whose son, a U.S. soldier, was killed in 2004 in the Iraq war. Mr. Khan’s speech at the Democratic National Convention was one of the most emotional moments of the convention. President Elect Trump made fun of the family and conjectured that Mrs. Khan, who stood silently by her husband, was not allowed to speak. So I said, “I am not making light of the violence that is occurring at the protests right now, but you do not need to dismiss my concerns about what the future holds.” I did not think that was too offensive. As you might suspect, a part of me wanted to lash out, say something cruel. I looked at this stranger’s FB profile. Apparently she loves her grandbabies and her state university. I don’t really know why she felt the need to attack me, a stranger to her as much as she is to me. Scream without raising your voice. Anyway, I decided to take a break from Facebook. If you see this, it doesn’t mean I’m on FB again, WordPress just automatically sends my blogs to Facebook when I publish them. It’s Saturday night, this dramatic week is nearly over. I don’t mind saying I’m glad to see it go. I have a party I need to get to and I need to change into something cute. (Typos and run on sentences, be damned.) Tomorrow is another day, a new week. But tonight, I want to raise a glass and toast my friends and say that I’m sad. If you’re sad too, I get it. Tomorrow we can leap and soar and fly, but tonight, suffer the needle chill, we are running to stand still. Yesterday, my friend Louie called to tell me that our mutual friend Angela had been messaging him about me. It seems Angela is worried about my recent involvement in church. I pressed Louie for details and then stopped myself. The whole thing kind of irked me and I felt the more I knew the angrier I’d get. “Are you worried about me?” I asked Louie. Louie said he wasn’t. And then I wondered if Louie was just saying that to placate me. I have an active, bordering on paranoid, imagination and ever since talking to Louie, I’ve had this image of every person I know, by text, email or Facebook messenger, communicating with each other with the subject line: We need to talk about Ray. Never mind that I’m sure Angela’s intentions are pure, that she just cares about me and wants me to be happy. When I lived in New York, one of the young men who had been in my youth group when I was a youth minister came to visit me. He was a freshman at an East Coast college. I had worried a bit about our trip. I had come out to myself and most of my NY friends knew I was gay but I had not started the process of telling the folks back home, so to speak. In our time in New York, we didn’t talk about my sexuality. I didn’t really think he’d figured it out. But a few days after he left, I received a late night call from one of the girls, now in college, who had been in my youth group. “Ray, I’m just going to ask you, are you gay now?” “What?” “Gary just called us and he thinks you’re gay now.” I told her that this wasn’t the way I wanted her to find out, but yes, I was gay. It was one of the saddest phone conversations I’ve ever had. This girl who called, even though we’re not supposed to have favorites, was one of my favorites. I felt I’d let her down, I felt I’d let the entire youth group down. Also, I was mad at Gary, I questioned his intentions for sharing this piece of information before I felt comfortable with others knowing. And if he’d been so sure, why hadn’t he asked me if I was gay while we were together in New York? In the months after that phone call, I found that this girl gathered all in the youth group, my youth group, who attended this particular university and they all prayed for me. Presumably, they prayed for me to stop being gay. But also, I think they prayed for me that I would know God’s love, find my way, find peace and joy. All day, I thought about Angela. For years, I was the source of concern (or gossip) because of my lack of faith and now I’m the source of concern because of my (perceived) return to it. And the irony is, I still don’t know what I believe. I just missed church and decided I wanted to find a church that affirms me, my people, and I found it. And I really like going. I do know this, I know what I have to remember. Angela loves me. Louie loves me. Those kids in the youth group loved me and even Gary loved me. They all just want the best for my life. They want me to be happy and joyful and at peace. I could spend a day or weeks﻿ or months or years ruminating about how people are talking, worrying, and texting about me behind my back, or I can just say, “They love me. I know they love me.” And move forward. Life’s too short and I don’t even know if heaven exists. 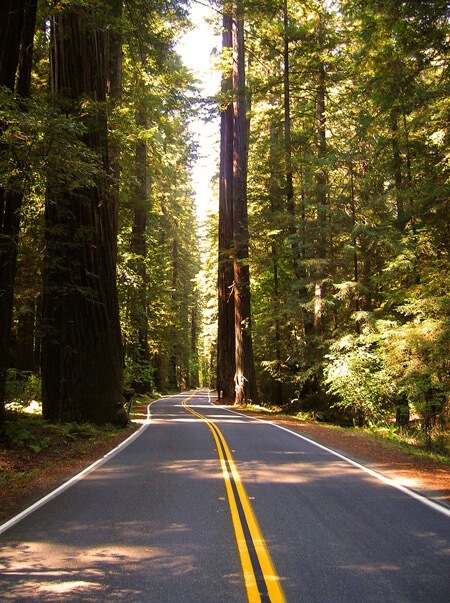 As I drove Highway 128 from Mendocino to Santa Rosa, towering redwoods flanked me for most of the journey. These old, gorgeous, distinguished trees were like nothing I had ever witnessed growing up in Kansas. Otherworldly, maybe even a little sinister. I had been in Mendocino for a friend’s wedding, and now it was Sunday. More than a little hungover, I headed home. My two dogs, Lucy and Mandy, in the passenger seats, were my docile navigators. On NPR, I discovered a Julia Sweeney audio cast, what I came to know as her one woman show, Letting Go of God. She spoke of a spiritual quest that she’d embarked upon that ultimately led to her embracing and accepting her own atheism. She talked about Biblical inconsistencies, other religions, Deepak Chopra. For some reason, probably because I was surrounded by the most majestic trees I’d ever seen, her thoughts on Jesus (cruelly? rashly?) condemning that fruitless fig tree have stuck with me in the decade since that day. I mean, DID that fig tree really have to die? It might sound strange, but that drive ended up being a sort of spiritual experience. 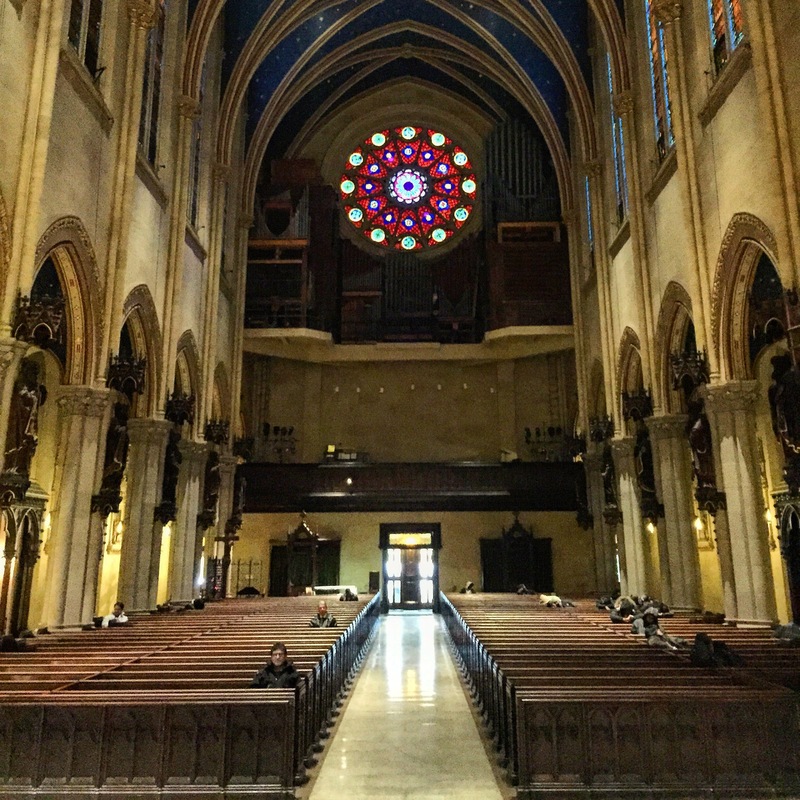 I was surrounded by beauty, my two dogs curled up next to me, it was Sunday morning, and I was listening to this woman’s compelling story about her complicated relationship with faith. It made me feel less alone about my own complicated relationship with faith, and God, and Jesus. Two Sundays ago, I joined the church that I have been attending for the last few months. Not a rash decision, it was something I had planned. On that Sunday, about 15 of us, old, young and in between, stood in front of the congregation and were introduced as new members. I tried to stand up straight, look proud, but also humble. I wore a tie. That morning, when I woke up, my first thought was, do I really want to do this? Am I ready to do this? Shouldn’t I wait until I’ve become a better person or a better Christian before I join a church again? I really do cuss a lot when I’m driving. And I’m a gossip. Also, I border on self-righteousness. But while a part of me said, “Take the day off, gets some donuts and go to the beach.” Another, louder voice, told me to go forward. There would always be questions, weaknesses, doubts, but why not explore those worries within the parameters of church, and church’s membership. On that Sunday, as I was sitting in the pew, in the second row, cordoned off for the new members, the minister told an anecdote about an atheist who attends our church, who after each Sunday’s service, shakes the minister’s hand and says, “I’m glad you haven’t given up on me.” I thought about that long ago drive, and the Julia Sweeney audio cast. 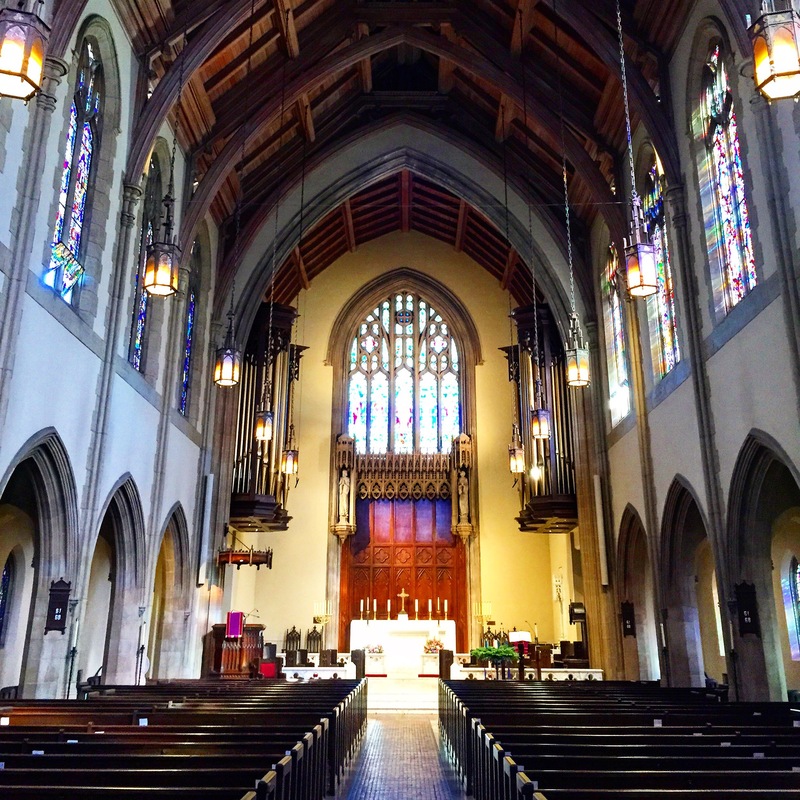 As I sat there, listening to the minister’s sermon, reflecting on that memory, it hit me, that all along, even in the decades that I avoided church, felt completely detached from God, that church and God had still been a part of me. Always. I loved church when I was little and I loved it as a teenager in youth group and I loved it in Bible college and, certainly, in my short time as a youth minister, I loved trying to help others to love church. And then I left the church, and I thought I’d left it permanently. Of course, I kind of knew that I had this fixation on church and religious themes. I still loved Amy Grant. Sometimes I read my old blogs. For three years now, I’ve written so much about God and Christianity and church it seems obvious, in hindsight, that it was all, always, leading up to this return. Is it possible to come home to somewhere you’ve missed for decades only to find that you never left at all? That you only thought you left? I’ll tell you what the big surprise in all of this is, it feels as if God has been saying to me, “Not only have I been here all along, but you have been here too.” And not that I even know exactly what the “here” is. Not that I was always faithful or always pure or always kind, maybe not that I’m even any of those things now. But God and faith and Jesus and Church are still a part of me, of who I am. Always have been, and fight it or not, always will be. It’s one of my favorite memories and surely, it’s one of the simplest. 1989, sitting in a field on a college campus in Central Pennsylvania. It was a church camp, I was there with the youth group I’d worked with on my summer internship at a church in Liverpool, New York. It had been a good summer, my senior year of college was weeks away. At this camp, part of the evening’s activities was a time allotted for each person, camper or counselor, to spend 30 minutes or so, in quiet time with God, reading their Bible, praying, journaling. While I was generally a person who did my “quiet time with God” in the morning, here we did it around 5:00 pm, when everyone had cleaned up for the evening but we hadn’t eaten yet. To be honest, and I do mean this in the best way possible, it was a little like a pre dinner cocktail. But here I was on this verdant hill, remembered now, even greener in my 27 year memory. 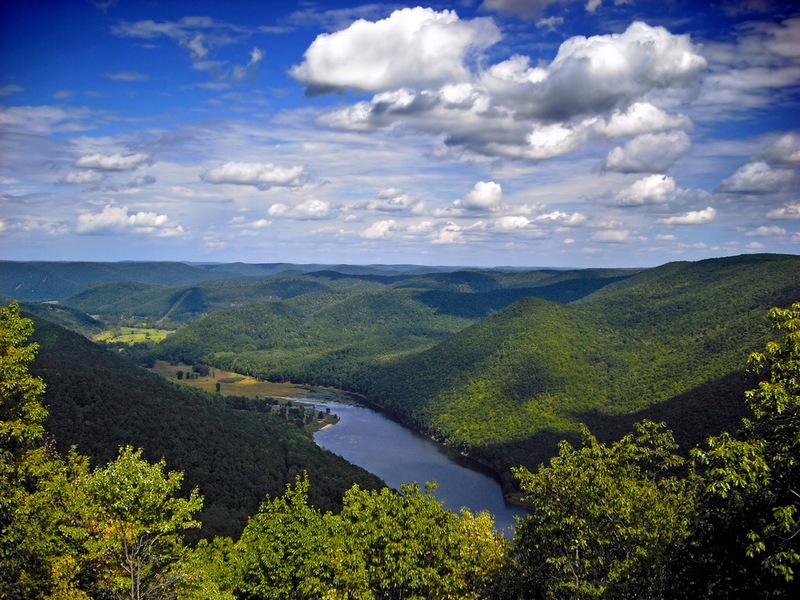 Perhaps I was even on a bit of a bluff looking as far as the eyes could see, at the hills and valleys of Pennsylvania. It was 70 degrees, the heat of the day slowly replaced by evening’s relief. And as I prayed and read and journaled that day, I was struck by just how much God loved me. Not only did he have mercy on me, not only did he forgive me, but he LOVED me. Had I always known that he loved me, yes, of course. But this was different. Nothing noteworthy had occurred that day, good or bad, but suddenly, maybe it was the stunning vista, but I was overwhelmed by great emotion. God Loves Me. On Sunday, in church, the minister, who was preaching about the Pentecost, and Acts 2, said that sometimes people are cruel to others because they can’t believe that God actually loves them. In the months since I’ve been back, I’ve thought about God’s love quite a bit. I know that one could make a case that all songs about God are about His love, most anyway, but my two favorite songs when I was very little were Pass it On and a perhaps forgotten gem called, In My Heart There Rings a Melody. I loved both for different reasons. Pass it On was a song the teenagers in my church sang and, at 6, I really wanted to be a teenager. The other song I loved because the title made me think of my favorite cartoon character, Melody from Josie and the Pussycats. What unconsciously drew me to these songs, though, I suspect, was the reminder of how much God loved me. ‘Tis a melody of love. And you know the very first song we learn in church, if we grow up in church, is Jesus Loves Me. So the hope is that as we grow up and go through life, this feeling, this assurance of God’s love is supposed to be what sustains us and bolsters and encourages us through the peaks and the valleys that is our life’s journey. I am so happy to be back in church. I love thinking about God and praying and trying not to cuss at my fellow drivers while I’m driving. I do feel God’s mercy, His forgiveness, His majesty. I just can’t say, at this moment in time that I feel His love. I’m such a stereotype, but I still get angry at God when good people suffer from cancer. I don’t understand why life is so hard for some people and just really easy for others. If I wanted to look closely at when I stopped feeling God’s love, ask myself when did I leave that mountaintop in Central Pennsylvania, I know it was way back when I first came out of the closet and left the church. I believed then that if God truly loved me, he would have made me straight. And I think that a few of us, we might go to church every Sunday, but something holds us back from the love of God. Like, why did You let my brother die or my Mom beat me or my Dad leave or my wife divorce me? We sit there in these pews with our broken hearts and maybe we feel like we can’t even admit it because admitting reveals our own faithlessness. Maybe in a way, I’ll never get back to that mountaintop, maybe those big emotions are mostly emblems of youth. Like I said, I am happy to be in church. And yes, I do know God loves me. I believe God loves me. And I know that feelings can get us into trouble sometimes anyway. I’m just, you know, putting it out there. Maybe it’s something you struggle with and hearing someone else voice it, might lighten your load. Why shouldn’t we be hungry, aching, and needy in our desire to feel Him whisper in our ear and touch our heart and call us beloved? I don’t have the answers. My blogs of late have mostly been a series of questions. If the day comes when I see my sexuality as a gift from God, is that when I will feel His love again? I don’t know. Maybe, though I don’t think it is the case, but maybe, the closest I will ever get to feeling God’s love again is what I feel when I look at the ocean, or a mountain range, or snow, or a star crowded sky. After all, they are from God, clearly gifts, and I just don’t think One would bestow on me such a treasure if He didn’t really love me. On Sunday, after church, I went to an orientation for people interested in joining the congregation. About 15 of us, we all sat around a table and wrote our names with sharpies for name tags we affixed to our shirts and blouses. The minister came in and introduced himself, shared a bit of his life story and asked us all to share our names, what we do, and briefly, our religious history. Not surprisingly, the group was filled with folks like me who had grown up in church and somewhere along the way, stopped going. When it was my turn, I shared that I had gone to Bible college, had been a youth minister, and that after I came out of the closet, that was the end of all of it. Also, for whatever reason, in the beginning of 2016, I decided I missed church. So, after more than 20 years, I started looking for a church home. After we went around the room, each sharing a bit of their own story, the minister told us about the church, its history, its positions, its outreach. Then he asked the room if anyone had any questions. The room sat quietly for a few seconds until finally, he said, “Surely the former youth minister has a question for me.” Everyone chuckled, I chuckled. “Actually, I do.” Another chuckle. I asked my question, so boring of a question that it doesn’t warrant repeating. A few others asked questions, and not much later, he dismissed us. As I left, my friend Richard and I went to shake the minister’s hand and say thanks. The minister said, “Ray, I hope you know that you are welcome here. 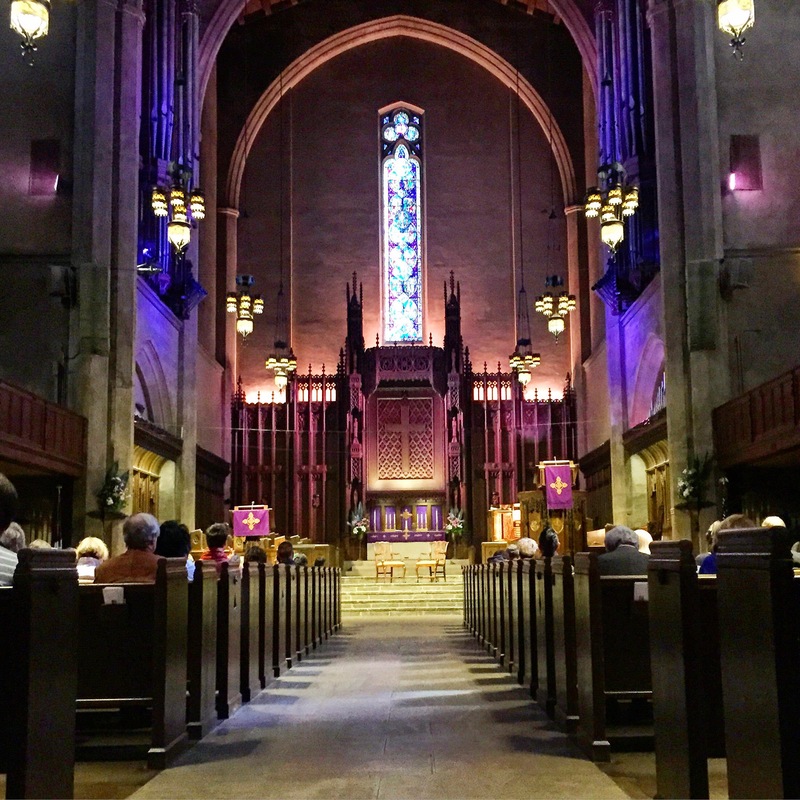 We have many LGBT members.” I laughed because, as I shared in my last blog, at this church, someone, everyone, is always reminding us, as often as possible, just how welcome every person is. I was a little high all that afternoon. And it wasn’t just the welcoming the gays part. But there was something thrilling about being called out for my time in the ministry. The former youth minister. And that somehow, if God had used me before, maybe God could use me again. As I was reading a book today, another memoir of a Midwestern gay who moved to New York to make his way, I had a flash of that exchange that took place on Sunday. “Ray, I hope you know that you are welcome here.” My eyes got blurry and I had to put my book down and I started to weep. It had not been emotional in the moment, but now, with some reflection, I thought, I have waited 25 years to hear those words from a church. I’d actually waited my entire life. From the time I was the little guy in a tan leisure suit and a wooden cross necklace, until the day I left, at 23, I was always trying to turn myself into the straight version of Ray. And here someone, an entire congregation, was offering the possibility, that Gay Ray, could be what God wanted me to be all along. And the idea was shocking, but also, a comfort. I bawled. It’s a lot. It’s enough to burden a person’s soul. I know it must seem like I say the same thing over and over again. I do and I know that I do, but I cut myself some slack because I don’t think I am the only person who has struggled to feel welcome, to feel home. And I know that I have conservative friends in conservative churches that have young LGBT kids in their congregation and it would mean so much to me, if that is you, you could reach out to those kids and tell them how much you are rooting for them. That your church is their home. That they are welcome. I know that some of you grew up, completely, all the way, house, kids, dogs, vacation home, grew up, but for some of us, childhood never seems very far away. And the people whose approval we wanted most in our youth are the affirmations we seek for the rest of our lives. And we are all a little broken, all a little weary. And don’t think you can tell someone too many times that they are welcome, because, maybe the opposite is so ingrained, that it takes a really long time to hear it. For the second time in two weeks, I have found myself in a church service on a Sunday morning. It’s hard to say how this all came about and certainly, I don’t have any idea where this new journey of sorts will lead me, but, this seeking, I guess you could call it, has been on my mind lately. I have found an old church, a congregation that dates back to the 19th century and its current edifice has been around for nearly 100 years. 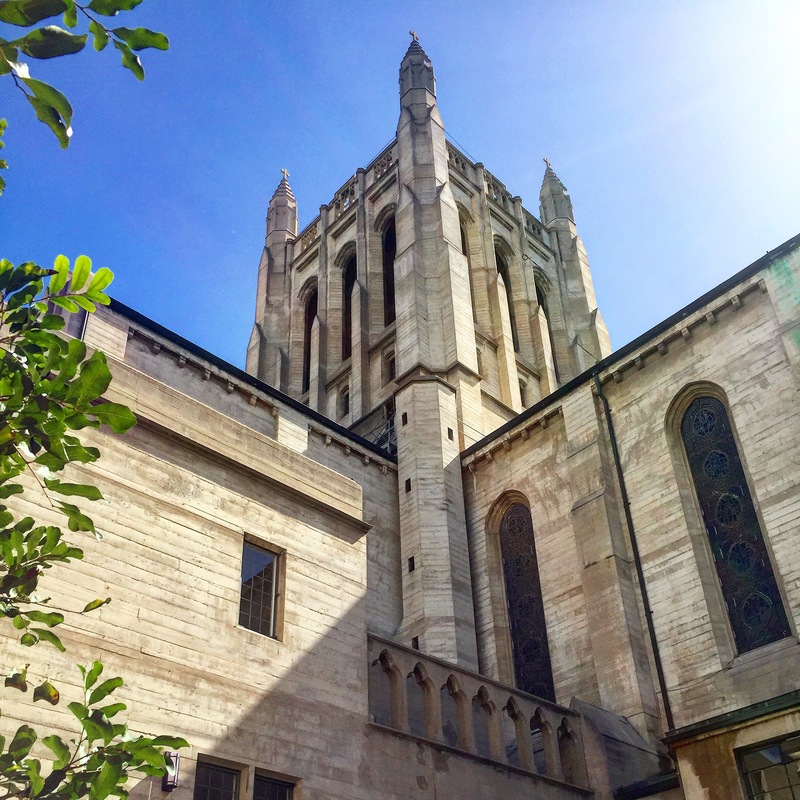 As you might expect, it is a congregation that welcomes, affirms, and condones the LGBT community. For the month of February, the pastor’s sermons have been based on the Alice Walker novel, The Color Purple. So, long story short, it’s very different from the churches that raised me. If my mind had a tendency to wander at church when I was 10 and 15 and 22, one shouldn’t be surprised to learn that my mind still wanders (and wonders) when I am at church. I love looking up at the high, majestically high, ceilings of the sanctuary. I think about the men who built this church. It’s the kind of thing I think about when I visit historied, grand, ornate, towering churches. 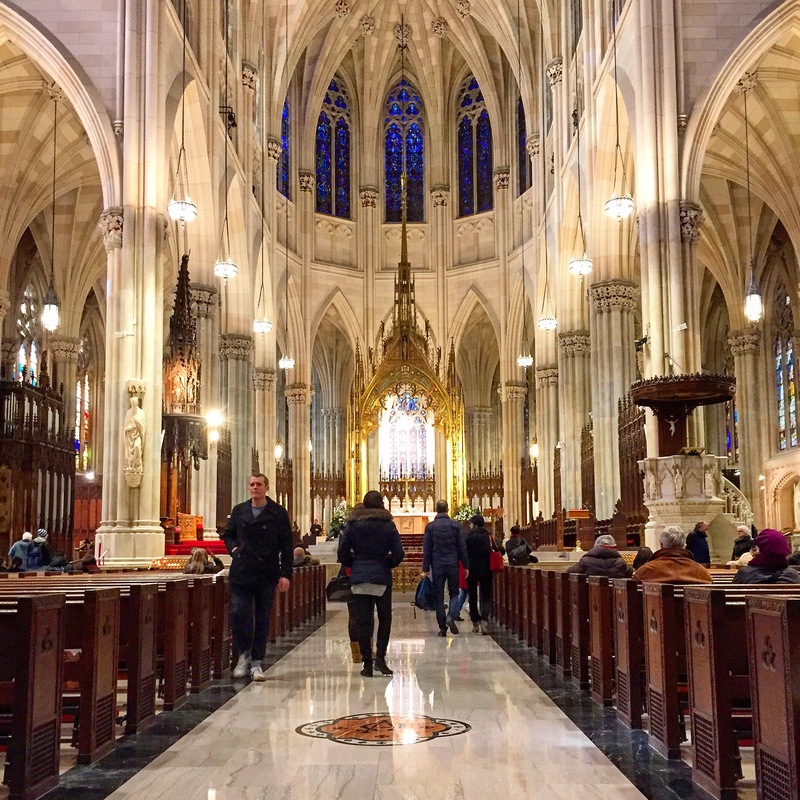 I thought about it when I visited St. Patrick’s Cathedral and Church of St. Mary the Virgin on my recent trip to New York. I look at the ceilings and think how men risked, and probably sometimes lost, their lives, creating these works of art, how some probably took great pride in their efforts. This will be my legacy, they might have thought. For others, the work might have been only a job, maybe not even a well compensated one. I don’t know. This morning, as I sat in my pew, occasionally looking up, I marvelled at the beauty of this church. I thought about how its current state was the sum contribution of many people with many stories. Some believers, some doubters, probably even some heretics. And then I looked down, looked around me, at the other people filling the pews. Maybe these parishioners are not all that different from the men who built this church all that time ago. Believers, doubters, heretics. Maybe, I went so far to imagine, we all have belief, doubt and heresy in varying amounts, in all of us. When I started this blog, a couple of years ago, I really had no idea how much I was going to talk about religion and God and Christians. Several times, in emails and Facebook messages, people from my midwestern past have asked me what I believe about God and Jesus and Heaven and Hell. And I usually just avoid the question because the truth is, I don’t know what I believe. For a long time, I thought that my questions or disbelief were a reason to keep me out of church. Why go if you don’t believe? But, somehow, in the last couple of months, I started wondering if maybe, those questions might have more value than I realize. And maybe a church is the best place to take one’s questions about God. Makes sense actually. I don’t really know where any of this is leading. While a part of me feels that I should know what my intentions or goals are, the louder voice tells me to just be still and listen. So here I am, listening. And for what feels like the first time in a little while, looking up.